Reverend Father Jolly was a great Dominican and a true patriot from St. Joseph, who loved his country and defended it whenever he was called to do so. Reverend Jolly was a very simple man from a strong educated family background; his brothers and sisters have all made their mark in Dominica and the Caribbean and beyond. His father was an excellent Head Teacher. I remembered seeing Fr. Jolly going to the Dominica Grammar School which was located in Great George Street in Roseau where I was born and brought up and lived for many years. He was very gentle and kind and had great respect for his elders including my grandmother Ma Case, who baked in Great George Street where he passed on his way to school. I remembered him buying bread and cakes (cross/cake) among others which he loved eating. Reverend Jolly wrote many books in which he always had a lesson to teach Dominicans. He was a consistent contributor to the newspapers of Dominica and in his many articles he reminded us that as a Christian nation we should pray for Dominica and its people. I remembered when the Caribbean Development Bank feeder road project was completed by the Dominica Freedom Party in 1981-1982. A ceremony was held at the junction of Carholm Road which included the Cuba Road, Atley/Chapara Roads and the Macoucherie Road. He blessed everyone who worked on these roads and prayed for Sir Williams Dumas, who was then President of the Caribbean Development Bank, who was present, and asked our Heavenly Father to assist him so that he could continue to help Dominica which had been destroyed by Hurricane David on the 29th August, 1979. "I present to you, my dear friends, with great joy, my Book 'In Search of a Just Society: The Mission of Emmanuel Christopher Loblack'. E.C. Loblack should be very dear to all the people of the Commonwealth of Dominica. He has rendered tremendous service not only to the working class but to all the people of Dominica. He was a man who was aware that he had a mission to perform. He undertook this task generously and wholeheartedly. He lived a poor life and died a poor man. But he died a happy man. I am very grateful to God that I experienced the friendship of that great man in the last few years of his life. May he be a role model for all people who relentlessly endeavor to fulfill a noble purpose in life." Before Fr. Jolly's death he was in the process of establishing an E.C. Loblack Foundation with the proceeds of the sale of his book. It is my wish that this process will continue. Reverend Jolly was one of two remaining Redemptorist Fathers in Dominica, the other being Reverend Franklyn Cuffy. Fr. Jolly was a lover of sports especially cricket and football. 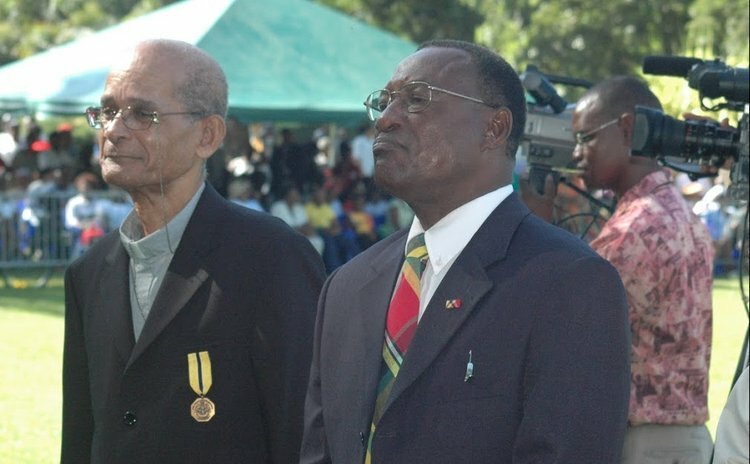 He always prayed for and encouraged the many sports men and women who represented Dominica in various sporting activities. I know that my whole family recognized the valuable contribution Fr. Jolly made towards the development of our beautiful Dominica especially Dr. Hedda Dyer Francis, his medical doctor who stood with him till the end. Well done Fr. Jolly, you served your country very well.